Rinse the barley well, meaning MANY times. 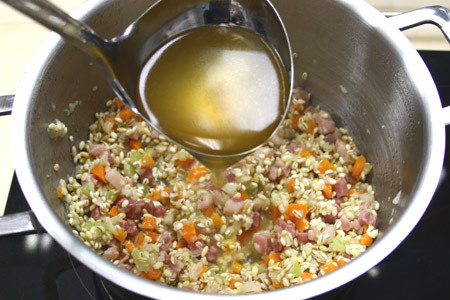 Set the meat broth to heat in a pot, and when it reaches a boil, add the barley and stir it all. Cook the barley covered , over a very low flame. It will cook for ca. 4 hours, stirring often to prevent the barley to stick to the bottom of the pot. When the barley is soften, remove the pot from the fire. Prepare some butter bits and melt it in the soup, together with the egg yolk and the cheese. Mix well and serve. If it results to dry because the liquid evaporated all as the soup cooked, add a bit more boiling water or broth. This entry was posted on Tuesday, November 6th, 2012 at 5:34 pm	and is filed under Italian Recipes and Food. You can follow any responses to this entry through the RSS 2.0 feed. You can leave a response, or trackback from your own site.